When you cast via Wi-Fi, you’re not limited to staying within 30 feet of the speaker to keep the music going—you can even leave the house and the music will continue to play. Chromecast technology lets you stream directly from the cloud, so you get the highest sound quality possible. Don’t have a network handy? You can pair Big Blue 100 directly with any Bluetooth® enabled device. • Wi-Fi never ruins the moment: Whatever groove you’ve got going on, you’ll never have to stop the tunes to take a call or a text from your brother. No more “do-do-doot” interruptions. • Wi-Fi casts millions of songs: To stream music, simply tap the “Cast” button that’s already built into major music, news and entertainment apps. • Wi-Fi streams to every room: With Chromecast technology and your Wi-Fi network, you can stream the same song everywhere, or play different music in every room using multiple apps. Start with one speaker, then grow your network by adding Chromecast Speakers throughout your home. You can even mix-and-match different Big Blue speakers with Chromecast built-in with other Chromecast built-in speakers. 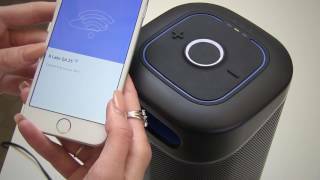 • Wi-Fi lets you leave: Unlike with Bluetooth pairing, you don’t have to remain close to your wireless speakers. You can start streaming your music and then run out to the store to get ice. Because Big Blue speakers with Chromecast built-in stream directly from the Wi-Fi network, if you leave the house you won’t break the signal, so the party keeps going. • These speakers have Bluetooth, too If you’re partying in the woods, jamming out slope side, or traveling other places without Wi-Fi coverage, Big Blue speakers with Chromecast built-in can also pair via Bluetooth wireless to your portable devices. Rock out—out there. The story behind the Big Blue 100 Small Wi-Fi & Bluetooth Speaker with Chromecast built-in We’re all about speakers you can enjoy just about anywhere. (And we mean anywhere.) And we wanted to create one to deliver great sound tailored to smaller spaces. Our Big Blue 100 Small Wi-Fi & Bluetooth Speaker with Chromecast built-in is compact in size but carefully engineered to deliver beautiful, room-filling sound with its high-performance tweeter (for improved treble) and woofer (with enhanced bass). Stream from music apps or your song library over Wi-Fi or Bluetooth, or cast with Chromecast. If you feel like going big(ger), the speaker can pair with other Chromecast speakers for a whole-house sound experience. See? Good things do come in small packages. The Bluetooth® word mark and logos are registered trademarks owned by Bluetooth SIG, Inc. and any use of such marks by Brookstone is under license. iPad and iPhone are trademarks of Apple Inc., registered in the U.S. and other countries. App Store is a service mark of Apple, Inc. Android, Google Play and Chromecast are trademarks of Google Inc. Spotify is a trademark of Spotify Corporation. Pandora is a trademark of Pandora Media, Inc. Big Blue® is a trademark of Big Blue Audio, LLC. Q:Why doesn’t the Big Blue 100 automatically show as a device in the Google Home app? A:It may take several minutes for the Big Blue 100 to appear as a device in the Google Home app. Ensure the Big Blue 100 is within range of your Wi-Fi network. Ensure Bluetooth is enabled on your device. During set up, the Google Home app needs to access your device using Bluetooth. Restart Big Blue 100 by unplugging, then plugging back in and powering on. Reset Big Blue 100 (please refer to page 19 in the user manual for reset instructions). Q:Why won’t audio play through the speaker in Wi-Fi mode? A: Ensure the Big Blue 100 has been selected from the Cast menu in the Chromecast-enabled app. Ensure the Big Blue 100 is in range of your Wi-Fi network. Restart Big Blue 100 by unplugging, then plugging back in and powering on. Check Big Blue 100 or your device’s volume level. Q:Why isn’t there a Cast button in the app from which I would like to stream audio? A:Ensure the Big Blue 100 has been set up using the Google Home app (please refer to page 8 in the user manual for set up instructions). Confirm the app you would like to stream music from is enabled with Chromecast built-in. Confirm the Wi-Fi network enabled on your device is the same Wi-Fi network that was used when the Big Blue 100 was set up using the Google Home app. Confirm the Wi-Fi network used during set up with the Google Home app has all network privileges enabled. For example, a “guest network” on a router may not have all network privileges enabled. Refresh the Chromecast-enabled app. Q:Why doesn’t the Big Blue 100 appear as an available connection when I tap the Cast button in the app from which I would like to stream audio? A: Ensure the Big Blue 100 has been set up using the Google Home app (please refer to page 8 in the user manual for set up instructions). Verify the Big Blue 100 appears as a device in Google Home app device list. It may take a few minutes for a Chromecast-enabled app to recognize the Big Blue 100 as an available device. Refresh or quit and reopen the Chromecast-enabled app if the Big Blue 100 does not appear as an available device. The Big Blue 100 will stream audio from audio or music Chromecast-enabled apps; it may not stream audio from some video apps. Q:Why can audio only be heard through one speaker in a group? A:It may take up to a minute for audio to stream on all speakers in a group. Q:How do I set up Big Blue 100 on a new Wi-Fi network? A:Reset Big Blue 100 (please refer to page 19 in the user manual for reset instructions). After booting is complete, the Wi-Fi STATUS LED INDICATOR continuously flashes white to indicate the Big Blue 100 is ready to be connected to a Wi-Fi network through the Google Home app (please refer to page 8 for set up instructions). Q:Why does the Big Blue 200 show as a Wi-Fi connection on my device? A:The Big Blue 200 broadcasts a signal but the Wi-Fi connection is handled through the Google Home app. Q:How can I switch to Wi-Fi mode? A:Tap the Cast button in Chromecast-enabled apps to switch the Big Blue 100 to Wi-Fi mode. Q:Why is there no power off tone when the Big Blue 100 is powered off while using Chromecast built-in? A:The power off tone is not enabled when using Chromecast built-in. Q:How can I switch to Bluetooth mode? A:Ensure your device is within 33 feet of Big Blue 100 and connect your device to Big Blue 100 (please refer to page 13 in the user manual for pairing instructions) to switch the Big Blue 100 to Bluetooth mode. Q:Why won’t audio play through the speaker when the BLUETOOTH MODE LED INDICATOR is flashing blue? A:Select “BB 100 XXXX” in your device’s Bluetooth settings to connect. Q:Why won’t audio play through the speaker using Bluetooth? A:Ensure your device is within 33 feet of Big Blue 100 and reconnect your device to Big Blue 100 (please refer to page 13 in the user manual for pairing instructions). Restart Big Blue 100 by powering off and then on. Check Big Blue 100 or your device’s volume level. Why does the Big Blue 100 show as a Wi-Fi connection on my device? The Big Blue 100 broadcasts a signal but the Wi-Fi connection is handled through the Google Home app. Q:Why won’t audio play through the speaker using Aux Mode? A:Remove and reinsert the 3.5mm-to-3.5mm cable (not included) into the AUX IN port.